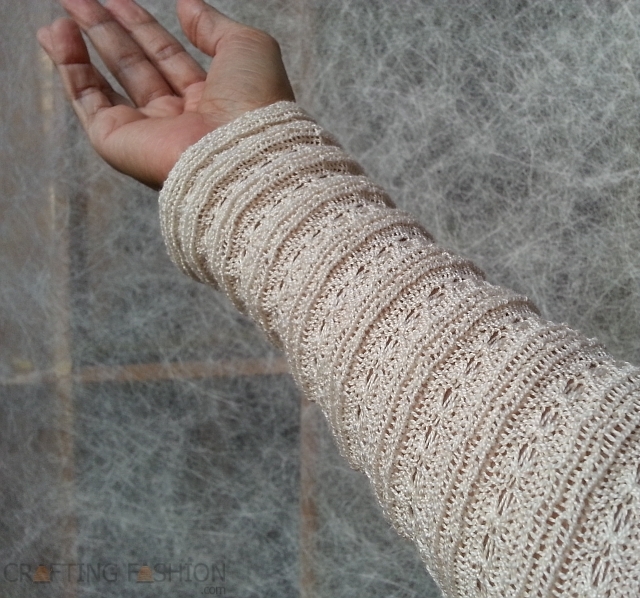 As I learned when working with the fabric for the Moonstone sweater, openwork knits present some challenges. I've found in the past that using a solution of Super Solvy (See Books, Notions & Tools > Really Useful Notions.) 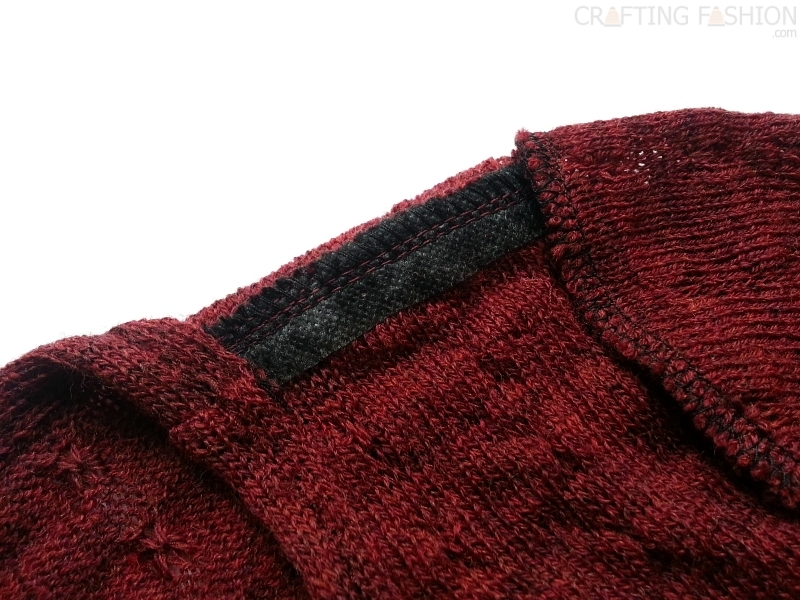 applied to all cut edges was the way to temporarily tame the stretch and curb the tendency of the fabric to ravel. (Read Further Notes on the Moonstone Sweater for detailed info.) I ended up using the very same fabric for the Blue Moon Renfrew, because I felt confident enough after that first Moonstone sweater. This openwork cotton knit is not a "true lace"; it's considered a "tuck lace" and is available in the O! Jolly! Shop. But just when I thought I had this openwork/stabilization thing down, I got a surprise with my current sweater project. 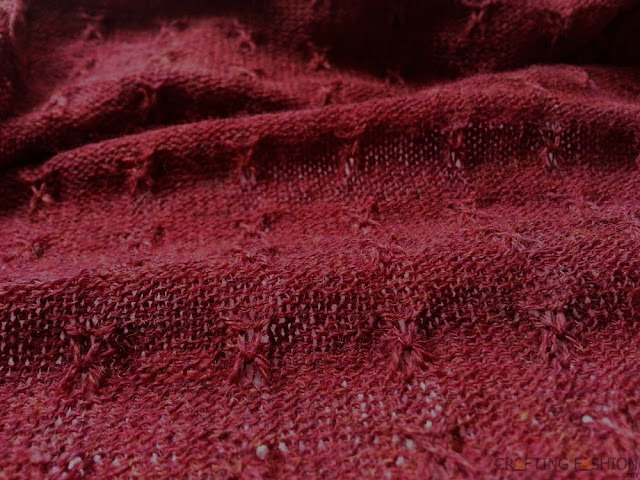 I'm using the fabric below -- just a slight suggestion of openwork but enough for me to be concerned about the color of the permanent shoulder stabilization I'd be using. More tuck loops, yes! I love them. What can I say? Because this fabric is wool, not as slippery as cotton, and with better recovery, I elected not to stabilize every edge after cutting. So... I suppose that's one way to get around potential raveling with openwork fabrics -- choose wool. ;) So far I haven't regretted the decision not to stabilize the edges. Wool is simply a wonderful fiber to work with. Getting back to the shoulder stabilization, I did choose to use transparent elastic again, because I was sure the white interfacing I had available would show through. And though the first shoulder went ok when sewing in the transparent elastic, the second shoulder did not go well at all. I ended up redoing the stabilization, this time with newly purchased non-woven, black interfacing. Thank goodness I had machine basted the elastic so that it wasn't too difficult to remove. As it turns out, I'm quite happy using the black interfacing. It's fusible and really easy to measure, cut, and apply. And it does its job. The interfacing doesn't seem to show through on the public side, when I hang it on my shoulder. But I'll know for sure when I'm done!